We have an official diagnosis for Mark now that he is two. For whatever reason, his neurologist wanted to wait until he was two to "officially diagnosis" him. In July of 2010, we took Mark to a neurologist because his pediatrician was concerned that his legs were too stiff. His legs couldn't go straight even when you tried to force them. Being the stubborn mom that I am, I made an appointment with another pediatrician for a second opinion. After another doctor told me that I needed to see a neurologist, I made the appointment. I try not to dwell on the month I lost by waiting for a second opinion. In a flash my life changed when the neurologist told us that Mark exhibited early warning signs of Cerebral Palsy. Mom honesty moment-I didn't even know what CP was. I had heard of it, but I didn't know what it meant. For those of you who do not know, it means that he suffered brain damage at birth. Since July, Mark has received occupational therapy, physical therapy, and feeding therapy. He has made amazing progress and I am very proud of him for working so hard. Last Monday we got the results of his MRI. 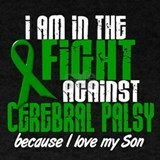 He was officially diagnosed with Spastic Cerebral Palsy. There are four parts of the brain that can be affected by CP. Mark has damage to all four sections of his brain. The good news is that it cannot get worse. The bad news is it will never go away, there is no cure.........yet. However, he is very lucky because he was diagnosed at a very young age and he has been getting therapy for a long time. And early intervention is key for kids with CP, so I am very thankful for his pediatrician who made the connection at such an early age. My little guy who couldn't sit on his own or hold a toy at 8 months old is walking and doing a half run at 2 years old. That's my little tough guy! Mark on his 2nd Birthday! It seems that you are keeping a positive attitude. That is so good! I may not be a mom of CP or a mom at all, but my mom is an aide in an Orthopedically Impaired class and there are kids in the class that have CP. They are so positive and it helps when there are people in their lives that are positive. You are Awesome! Keep the positive attitude up! When you can't be positive, think of something you're greatful for and focus the positivity on that. Im glad you got the diagnosis early! You never know what the future holds - there are always new medical advances and therapies! I just discovered your blog. I worked with a little girl with CP in the early childhood center setting. She had the greatest little smile despite what she was going through. I pray the best for you and your son.